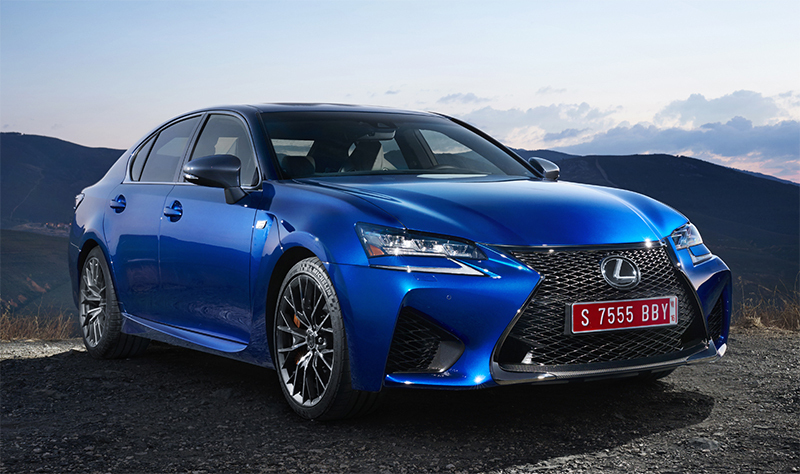 The new 2016 Lexus GS F performance sedan—based on the popular GS—is armed with a potent 467 horsepower, 5.0-liter naturally aspirated V8 and excellent handling developed on the most demanding race circuits, including the legendary Nürburgring. Its elegant-yet-aggressive styling effectively characterizes the essence of Lexus’ performance-oriented “F” brand, highlighted by bold front fascia with race-inspired functional air inlets, triple-beam headlamps, low-slung wide stance, large brake calipers, carbon-fiber rear spoiler and quad exhaust rear diffuser. While it’s more than capable of taking on a twisty mountain road, the GS F is still a sedan that’s ideal for everyday use. It seats five comfortably in a luxuriously appointed cabin filled with high-tech amenities and advanced safety technologies, including standard Lexus Safety System +. The GS F offers enthusiasts the best of all worlds: it’s a car that will provide thrills and excitement on challenging switchbacks, all the while offering occupants unprecedented style and comfort. “As Lexus’ “F” brand vehicles continue to evolve and grow in number, it is important that these models offer differentiated and unique driving characteristics in their segments. The GS F is a very capable performance sedan that offers excitement behind the wheel in all facets of performance driving. It’s something that’s fun to drive no matter who is driving or where it’s being driven. The sedan embraces the virtues of sound, response and limitless power feel to support Lexus’ “F” brand identity of a performance car,” said Yukihiko Yaguchi, Emeritus Chief Engineer of the GS F.
Inclusion of new Active Sound Control (ASC) which synthesizes the original sound through acoustic design, creating a more dynamic and three-dimensional sound inside the cabin. The heart of the exciting new GS F is undoubtedly its naturally aspirated 5.0-liter V8, which has been finely tuned to deliver excellent power and responsiveness. The engine’s reciprocating assembly targets lower mass with the help of lightweight forged connecting rods and titanium intake and exhaust valves, allowing it to reach a 7,300-rpm redline. Free-breathing 32-valve cylinder heads take full advantage of this engine’s reduced internal friction, and aggressive valvetrain. The working angle and lift of the camshaft have been designed to achieve ample torque production for continuous acceleration throughout the rev range. Add to the mix optimized intake and exhaust manifolds, and the seamless operation of a high-performance-tuned Variable Valve Timing (VVT-iE) that delivers optimal power in all situations, and the result is an engine that delivers 467 horsepower and 389 lb.-ft. of torque. In addition to producing plenty of power, the GS F’s V8 is also remarkably efficient, thanks in part to the tuning of its high-pressure D-4S direct injection system (Direct injection 4-stroke gasoline engine Superior version), which allows the engine to operate with a very high compression ratio of 12.3:1. Another important factor in maximizing power and efficiency in a high-performance engine is to include a precision-engineered exhaust system. The cross section area of the exhaust gas passage of the GS F has been increased, while joint sections of the exhaust system have been enlarged to help reduce backflow pressure. Additionally, to help enhance the sound quality of the exhaust note, a high-function baffle has been placed near the exhaust tips that utilize stainless steel wool as well as glass wool to help achieve a more baritone exhaust note. The exhaust tip design is aesthetically pleasing thanks to the implementation of a stylish baffle end cap structure integrated into the low-slung bumper section that envelops it, giving the setup a very tidy-yet-aggressive appearance at the rear of the vehicle. Recognizing that sound is a key ingredient of the “F” brand formula, Lexus engineers have taken the auditory experience of the GS F to a new level with the inclusion of Active Sound Control (ASC). ASC electronically synthesizes and assists the sound to the engine and the exhaust note in response to accelerator and shift lever operations, then disperses a sonic note via the speakers installed at the front and the rear of the cabin. When engaged, the sound output from the front speaker rises along with the engine speed to emphasize the high tone of the air intake as well as the mechanical sounds from the engine itself. Simultaneously, the rear speaker delivers a strong low-frequency sound that emphasizes the powerful exhaust note coming from the rear of the vehicle. The front and rear speakers operate during SPORT S+ mode, while only the rear speakers function when driving in SPORT S mode; ASC is automatically turned off when driving in NORMAL or ECO mode. When there is a sudden change in engine rpm—such as when a gear shift takes place—the ASC system will instantaneously respond in kind to further elevate the dynamic driving experience. The driver can manually turn the ASC system on or off with a switch located on the driver’s side of the instrument panel. The V8 engine adopts Atkinson cycle to enhance fuel efficiency at cruising speeds and Otto cycle for higher performance levels when accelerating. “The GS F’s V8 delivers the high level of performance worthy of the “F” model. Painstaking tuning to the VVT-iE, the adoption of a high static compression ratio and the Atkinson cycle have resulted in fuel economy that is beyond the usual range of a large-capacity 5-liter engine, particularly during high-speed cruising. Furthermore, with control that includes idling speed in response to air conditioner load, the GS F boasts practical fuel economy comparable with vehicles equipped with idling stop systems during urban driving,” Yaguchi said. The GS F’s V8 comes mated to an equally efficient gearbox: the 8-speed Sport Direct Shift (SPDS) automatic transmission that offers smooth shift feel, excellent drivability, linear acceleration and exceptional fuel economy under all driving conditions. Remarkably lightweight and compact, thanks to a die-cast aluminum case and internal components including the clutch hub and drum sun gear, the transmission’s operation and fuel efficiency are enhanced due to the inclusion of a high-efficiency oil pump and an ultra-compact high-pressure large flow volume solenoid that have been designed to reduce frictional and mechanical losses. In configuring gear ratios, the first gear has been tuned to provide excellent response from a standstill. Conversely, the middle close-gear ratios have been selected for their combination of fuel efficiency as well as the ability to briskly accelerate at intermediate speeds. At the far end of the transmission spectrum, the eighth and final top gear is an optimal ratio for enhanced fuel economy at high speed. Transmission performance is further enhanced with the adoption of the Lexus G force Artificial Intelligence Shift control (G AI-SHIFT). When driving in the SPORT S mode, the system selects the suitable gear ratio for sporty driving by monitoring the vehicle’s G sensor while simultaneously tracking the degree of throttle opening; if the driver invokes a higher degree of throttle (i.e. when accelerating), a quicker upshift will take place due to high-response shifting. Furthermore, the G AI- SHIFT control further elevates spirited driving by intuitively and succinctly blipping the throttle on downshifts. When driving in the SPORT S+ mode, performance driving is further aided by the system allowing the engine to maintain a higher rpm level, which may be desired when driving under high-load conditions such as on a race track or a winding mountain road. The all-new Lexus GS F has been designed to be enjoyed by all driving enthusiasts, from recreational commuters to more experienced drivers. While this 4-door doesn’t forget its sedan utility, its main mission is to provide an exhilarating driving experience in a wide range of conditions. The innovative Drive Mode Select system allows for enhanced driving performance and enjoyment by allowing the driver to choose the most appropriate drive mode to match their preferred driving style and/or situation. Selections include NORMAL, ECO, SPORT S and SPORT S+. The driver can easily cancel a given drive mode at any time. Provides the smoothest, most balanced ride quality and drivetrain performance. Engine output and throttle opening operate in a manner that perform equally well in traditional city and highway driving. Helps to enhance fuel efficiency by optimizing throttle opening, engine output and the air conditioning/heating (HVAC) system. Excessive throttle input by the driver at low speeds is automatically adjusted and suppressed to enhance fuel efficiency. The heating/cooling capacity and airflow of the climate control system are adjusted lower for engine speed and compressor operation; if the outside temperature is 68°F or higher, the air conditioner will automatically switch to the recirculation mode for a certain period of time. Exhibits more powerful acceleration characteristics for performance-oriented driving with controlled engine output and throttle opening from the powertrain. Simultaneously, the engine, transmission and other key components become more powerful and responsive in terms of power output and vehicle acceleration. Makes available maximum sports performance potential of the vehicle by extracting the most from the powertrain with the SPORT S driving mode and providing additional performance capability through further modulation of the Electric Power Steering (EPS) steering assist for the greatest degree of communicative feel to the driver. Meticulously tuned through countless hours of test driving on the world’s most distinguished racing circuits, the available Torque Vectoring Differential (TVD) enhances dynamic performance by precisely controlling rear wheel torque, helping to manage the vehicle’s orientation when cornering. What’s more, the TVD system has been tuned to provide a very natural feel—its operation is virtually imperceptible to the driver. The TVD transfers torque between the right and left tires with the ideal amount based upon data including throttle input, braking, yaw rate, longitudinal and lateral G-force, and other pertinent parameters. More remarkable still, the amount of torque transferred between each rear wheel (right/left) is virtually instantaneous and optimally controlled regardless of whether the accelerator pedal is depressed or not. Allowing the driver to navigate with more confidence than ever before, the Torque Vectoring Differential (TVD) on the GS F accentuates driving enjoyment well beyond that of what a traditional rear-wheel-drive vehicle can offer. Delivers a high level of control and agility for ideal vehicle behavior. Places additional emphasis on steering response, giving the vehicle a more agile character akin to one with a smaller wheelbase. Helps provide added handling when driving at higher speed, allowing the driver to accelerate with confidence. A unique attribute of the TVD is Drive Power Control. By using high-response compact motors as the ECU computes the ideal amount of torque transfer, a speed-multiplying planetary gear instantaneously changes left/right torque distribution through the engagement of a multi-plate clutch. This highly advanced system is able to finely tune torque distribution in only 1/1000th of a second. Lexus VDIM integrates the usually separate ABS, VSC and TRAC functions, to provide proactive seamless control of basic “drive-turn-stop” vehicle performance. It can anticipates any loss of traction and provides smooth control for the normal driving range. Similar to the RC F, the GS F has new SPORT and EXPERT modes for its Vehicle Dynamic Integrated Management (VDIM) system. VDIM with SPORT and EXPERT modes is exclusive to “F” models. VDIM SPORT mode gives priority to driver control. This mode offers greater driving enjoyment for circuit use, applying optimum VSC/TRAC mapping. EXPERT mode is a control mode for drivers who want proactive handling of the vehicle. For this mode, the system turns off TRAC, switches VSC controls and controls the engine and brakes to assist the driver. This mode not only contributes to the enjoyment of sporty driving on the circuit, but also helps drivers hone their driving skills. When SPORT S+ is selected with Drive Mode Select, the Expert mode is activated by operating the VSC off switch. Normal mode is for smooth driving with active safety features under normal driving conditions. Special features of GS F’s vehicle control systems include a newly adopted vertical G sensor in the ABS control, to help ensure optimized brake force. In addition, Lexus has extended the VDIM co-operative control function, allowing the VDIM to delegate two brake control functions to the Torque Vectoring Differential (TVD) control – drive-force distribution and yaw moment control. VDIM controls the torque transfer co-operatively with the TVD, for more seamless control of driving and turning. The GS F drives efficiently through corners with its straight line stability, thanks in part to its newly developed chassis that features a rigid structure, responsive yet compliant suspension system, and excellent brakes. New parts have been developed to help maintain handling control and performance of the GS F. These include placing high-rigidity front and rear body braces at key positions (the front brace is closed-section for an even higher degree of stiffness); increasing the number of attachment points for the front brace; and newly developed mounts for the rear suspension. The double wishbone front suspension includes lightweight high-rigidity forged upper and lower aluminum control arms with exclusive coil springs, stabilizer, and bushings. The rear multi-link unit features forged aluminum control arms with increased torsional rigidity along with optimized suspension arm bushings. To enable faster vehicle speeds when cornering—especially noticeable in high-speed sweeping turns—suspension performance is further enhanced thanks to the fitment of large diameter and wide tires that are capable of handling the high lateral G loads generated by the vehicle as well as responsive ZF Sachs® shock absorbers. The GS F’s stopping power is provided by Brembo brakes that feature lightweight and high rigid opposed 6-piston aluminum mono block calipers with 380-mm diameter brake discs at the front and opposed 4-piston aluminum mono block calipers and 345-mm diameter discs at the rear. The ventilated brake discs are equipped with slots on the braking surface for high fade resistance and stable effectiveness, as well as spiral fins for excellent cooling performance. A large diameter master cylinder and booster combination helps to achieve highly responsive brake feel along with a short, performance-oriented brake pedal stroke. openings has been placed in the front fascia just below the headlights and forward of the wheels at the front corners of the vehicle. The GS F’s electronic power-assisted rack and pinion steering has been designed to achieve excellent dynamic performance and steering feel. Intensive testing and calibration of the power-assist curve ensures the steering feel matches vehicle characteristics. A damper-less intermediate shaft has been added to the steering column to help increase steering rigidity upstream and ensure high responsiveness to steering input. The GS F was designed with high performance in mind; as such, aerodynamics played a key role in determining the car’s exterior shape. One of the most challenging areas to tackle was the front tires, as they created a great deal of turbulent air that increased drag as it passed the rest of the vehicle. Special groove-shaped front fender liners have been fitted that allow air to flow more freely near the front section of the car. The vehicle’s overall aerodynamic efficiency has been enhanced with specially designed undertrays (beneath the engine compartment) and lateral trays (beneath the midsection of the vehicle near the rocker panels) that optimize cooling air to flow toward the rear differential. There’s a special undertray at the rear section of the vehicle that rises at an angle to function like a rear diffuser. Aerodynamic stabilizing fins have also been added to various sections of these panels to help further suppress airflow turbulence and reduce drag. 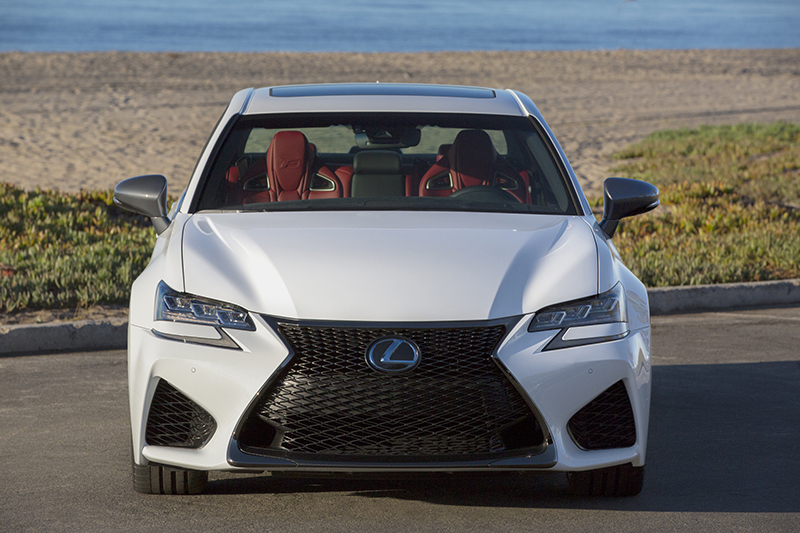 The front fascia is defined by an aggressive representation of Lexus’ trademark spindle grille, featuring special “F” series mesh and a pair of dramatically wide and tall air inlets beneath the headlights. These openings funnel massive amounts of air into specially-designed ducting inside the grille to maximize brake cooling. The grille also features a new lower molding, made from Carbon Fiber Reinforced Plastic (CFRP) that provides downforce to the front of the car. Wide front fender flares with large air outlets allow excess airflow to escape down the sides of the vehicle, while broad fenders and sculpted rocker panels provide visual muscle, hinting at the car’s sporty nature. When viewed in profile, the GS F’s flowing silhouette is further enhanced by aerodynamically shaped side mirrors and B-pillar trim sections covered in glossy dark-colored metallic paint to contrast with the vehicle’s exterior paint color. Also adding distinction are available bright orange-colored front and rear brake calipers emblazoned with the Lexus “F” logo, and hand-polished 19-inch multi-spoke forged aluminum wheels manufactured using weight-reduction technology shod with low-profile 255/35ZR19 tires at the front and 275/35ZR19 tires at the rear. The rear of the vehicle follows the same aggressive design theme as the front, highlighted by the “F” brand’s trademark quad exhaust tips. Other highlights here include a downforce-generating CFRP rear spoiler mounted on the trunk lid (matching the carbon-fiber used on the grille lower molding), a rear diffuser beneath the rear bumper section, fin-shaped aerodynamic enhancements adopted at the bottom edge of the rear bumper’s painted lower garnish to improve airflow and reduce drag, and organically shaped rear taillights with jet black plated moldings within the lamp unit and on the trunk garnish. Although based upon the existing Lexus GS platform, the GS F possesses different exterior dimensions than those of its counterpart. It measures longer and wider, the result of extended front and rear overhangs, while standing lower to the ground. There has been no sacrifice made in interior or luggage space, which can accommodate up to four golf bags. A trunk pass-through adds additional cargo capacity. Available exterior paint colors include Molten Pearl, Ultrasonic Blue, Ultra White, Atomic Silver, Liquid Platinum, Nebula Gray Pearl, Caviar and Matador Red. The interior of the GS F tastefully melds superior craftsmanship and affluence with world-class ergonomics and functionality. But as a performance premium sedan, designers made sure to place special emphasis upon creating a driver-centric cockpit. This pilot-focused design theme is characterized by the information display/gauges positioned directly in front of the driver. Close attention has been paid to important details such as the size and thickness of fonts and indicators for easy recognition by the driver. The center analog Thin Film Transistor (TFT) tachometer has a large diameter with silver ornamentation. Of particular note, the look and information displayed within the center meter changes in accordance with each Drive Mode selected (see “Driving Dynamics” section for more info). A standard color Heads-Up Display (HUD) allows the driver to see pertinent info such as speed, tachometer/read indicator and gear shift display conveniently without taking his/her eyes off the road ahead. 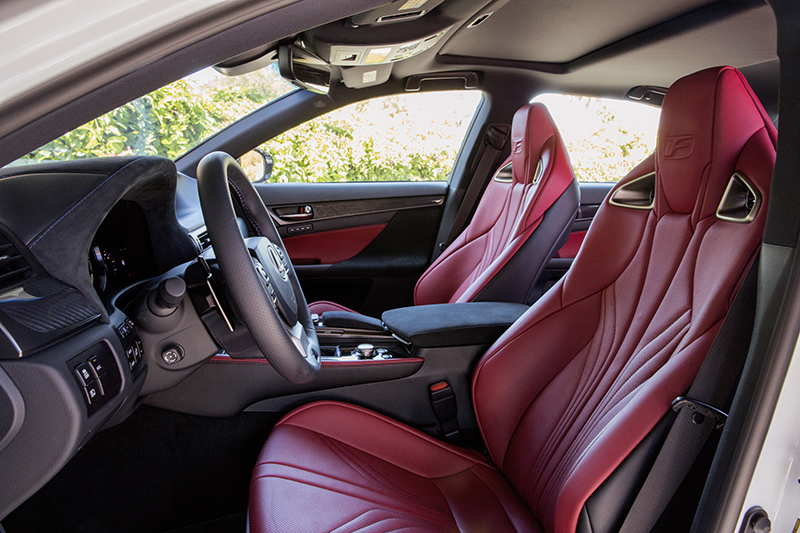 In pursuit of outstanding comfort and ergonomics as well as instilling the proper “F” atmosphere, the GS F adopts “F”-exclusive sport seats with Smooth Leather seating surfaces for the front and the rear, with high backs in the front seats. The bucket-type front seats provide optimum support and comfort, thanks to pronounced bolstering for the thighs, hips and lumbar sections, as well as an ergonomically enhanced design for the shoulder section. What’s more, the sewing pattern and stitching on the front seats have been placed so that it closely mimics the skeletal and musculature of the human body for the highest degree of comfort and stability, while greatly reducing fatigue on long drives. The rear seats utilize the same ergonomically-enhanced sewing/stitching pattern while also including exclusively designed headrests that mimic the seatback design of the front buckets. Along with the seating, the performance theme is carried over to the exclusive “F”-badged multifunction three-spoke steering wheel with short-stroke gearshift paddle shifters, shift knob and foot pedals. Only the highest-quality materials and trim have been used throughout the cabin, notably in the ornamentation. Carbon Fiber trim adorns a number of surfaces, and the door trim, the center register and the base of the Remote Touch Interface feature a lustrous Metallic Dark Silver paint. High-grade Alcantara envelops the top of the instrument panel, door trim, center console and palm rest; in addition to its excellent slip resistance, the Alcantara-clad section above the instrument cluster is an ideal material for reducing glare and reflection. In a further nod to the exquisite attention to detail of the GS F interior, specially-crafted decorative rivets featuring the Lexus logo have been used to secure the Alcantara to the instrument panel. A new white LED interior illumination concept has been implemented that combines warmth with superior illumination qualities. Specially selected LEDs have been adapted to the system to help maintain uniformity throughout the cabin. 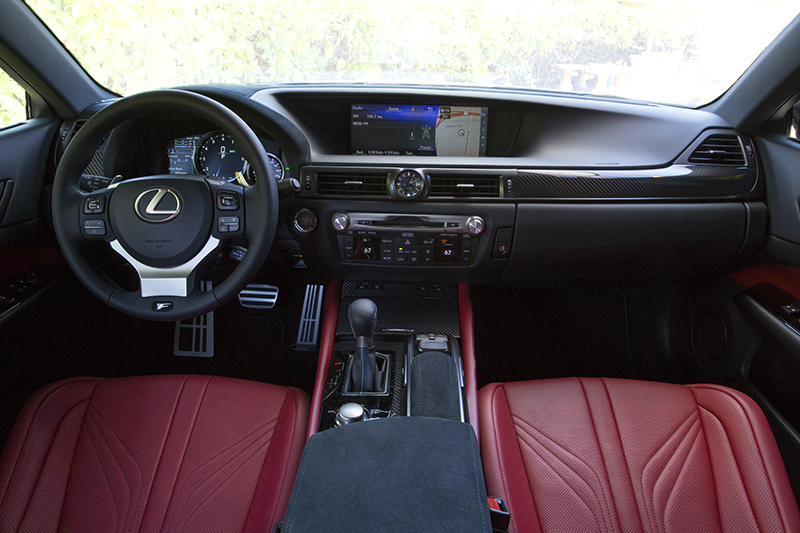 Interior color schemes available on the GS F include Stratus Gray, Black, and Circuit Red. In addition to its exceptional handling and power, the all-new GS F benefits from the comprehensive array of advanced on-board technologies that have become a Lexus trademark. In developing the audio systems for the GS F, the engineering team targeted a speaker system that replicates the sensation of sound experienced in a concert hall or movie theater. To achieve this powerful and realistic sound quality, the door panels that house the high-quality sound system components have been redesigned to achieve maximum acoustic performance. Two audio systems are available: a fully-digital 12-speaker system with a high-efficiency 299-watt amplifier, microSD card slot and a Coherent Source Transducer (CST) that smoothly blends high and mid ranges while suppressing phase deviation to help support the perception of sound localization, and a 17-speaker Mark Levinson surround sound system with an amplifier capable of outputting the equivalent of 750 -watts that includes GreenEdge™ speaker technology that enables more than double the sound output with the same amount of power. An available Remote Touch Interface (RTI) offers intuitive functionality like that of a computer mouse. A high-resolution, high-color definition 12.3-inch Electro Multi Vision (EMV) touch-screen display allows for convenient operation and setting adjustments of a number of systems including audio, climate, telephone, navigation, etc. The navigation system allows touchscreen access to five frequently used functions—map, audio, ECO mode, telephone and air conditioner— as well as hands-free phone operation and, in a Lexus first, incorporates an Inrix information display that can obtain a variety of information via a mobile phone or a Wi-Fi network including current location, five-day weather forecast, fuel prices, etc. The available Lexus Enform system operates in conjunction with the integrated SiriusXM® Satellite Radio receiver (with all-access 90-day trial subscription). Optimum cabin comfort is maintained even during track outings, thanks to the GS F’s climate control system that includes S-FLOW, an energy-saving airflow control mode that only operates the climate control for the front seat occupants when the system detects that there are only two people on board, allowing for improved cooling/heating efficiency as well as reduced fuel consumption. An available Lexus Climate Concierge system automatically controls heating devices, seat heaters and airflow volume of the seat ventilation which directly comes into contact with the vehicle’s occupants and includes a deodorizing filter that, in addition to removing pollen and dust, also removes exhaust gas from the ambient air. Available advanced safety technologies include: Parking Assist Monitor/Rear View Monitor; Intuitive Parking Assist/Lexus Parking Assist-sensor; Blind Spot Monitor; Rear Cross Traffic Alert/Rear Crossing Traffic Alert; and Lexus Safety System +. A full complement of safety features such as Supplemental Restraint System (SRS) airbags, Drive Start Control, security alarm system with ultrasonic break-in sensor, and tire pressure warning system are included on every vehicle. The standard Lexus Safety System + helps mitigate collisions across a wide range of vehicle speeds and conditions. It integrates several of Lexus’ existing active safety technologies including: the Pre-Collision System (PCS) which uses sensors to detect sudden stops initiated by the vehicle in front, warning drivers of potential contact with obstacles ahead; Lane Departure Alert (LDA), which issues an audible signal if the vehicle strays from its intended visibly marked lane; Automatic High Beam (AHB) that helps provide optimal forward visibility during nighttime driving; and Dynamic Radar Cruise Control (DRCC). Pre-Collision System (PCS): Utilizing both camera and a millimeter wave radar sensor, the available Pre-Collision System uses sensors to detect other vehicles or, under certain conditions, pedestrians in front of the vehicle. If the system judges that there is a possibility of a collision, a warning is activated. After the warning, the amount of additional hydraulic brake pressure provided when the driver depresses the brake pedal is increased in stages according to the level of possibility of a collision. An additional layer of peace of mind is provided within the system through Pre-Collision Brake. If the system detects there is a possibility of a collision, the vehicle’s brake lights illuminate before the driver applies the brakes. In addition, if the system judges that there is a high probability of a collision, it automatically activates the brakes, helping to avoid the collision or mitigate the impact force to occupants and the vehicle. Lane Departure Alert (LDA): The LDA issues an audible signal if the vehicle strays from its intended visibly-marked lane. Automatic High Beam (AHB)/Adaptive High-beam System (AHS): AHB helps provide optimized forward visibility during nighttime driving and automatically turns off the high beam headlamps when another vehicle is detected. When no other vehicle is present, the system turns on the high beams. AHS, an optional enhancement for the AHB, automatically optimizes the headlamp light distribution so that the high beams do not directly illuminate preceding or oncoming vehicles. If an abnormal shift (R → D, D → R, N → R, P→D, P→R) is detected while accelerating, a warning is displayed in the multi-information display and power output is reduced to limit the acceleration. The AL-TPWS monitors tire pressure at each individual wheel and alerts the driver if a tire has low air pressure. Based on data from a sensor installed in the tire, the tire pressure values for all four tires are displayed in the instrument cluster. When low tire pressure is detected, the air pressure value of the affected tire is shown in amber, and the figure is highlighted. With conventional systems, when air pressure drops in one of the tires, the driver is notified by a general warning lamp; however, AL-TPWS clearly indicates which of the four tires has low-pressure status. The TPWS reset operation can be done by the steering wheel switch and on the Multi-information Display. Employing a quasi-millimeter wave radar installed on the back of the vehicle, the Blind Spot Monitor (BSM) can detect a vehicle present in adjacent lanes as well as a vehicle traveling at a high speed approaching the driver’s blind spot. Working in concert with the Blind Spot Monitor (BSM), the Rear Cross Traffic Alert/Rear Crossing Traffic Alert (RCTA) alerts the driver to objects approaching the rear-side of the vehicle with an audible alert as well as flashing indicators on the vehicle’s external side mirrors. The Rear View Monitor System helps the driver to back into and out of parking spaces by displaying lines indicating vehicle orientation and vehicle width by a camera mounted at the back of the vehicle. The intuitive parking assist/ Lexus parking assist-sensor notifies the driver of the approximate distance between the vehicle and an obstacle using a display and buzzer. Every Lexus GS F model features a comprehensive Supplemental Restraint System (SRS) that includes dual-stage driver’s and front passenger’s dual-stage airbags, driver’s and front passenger’s knee airbags, front side airbags, front and rear seat side curtain airbags and rear side airbags. An advanced security system that includes security alarm control with an ultrasonic break-in sensor and tilt sensor incorporated within the yaw rate G-sensors available for some regions.